In reality it was a race of one. His team mate was close throughout, but may as well as been nowhere near. 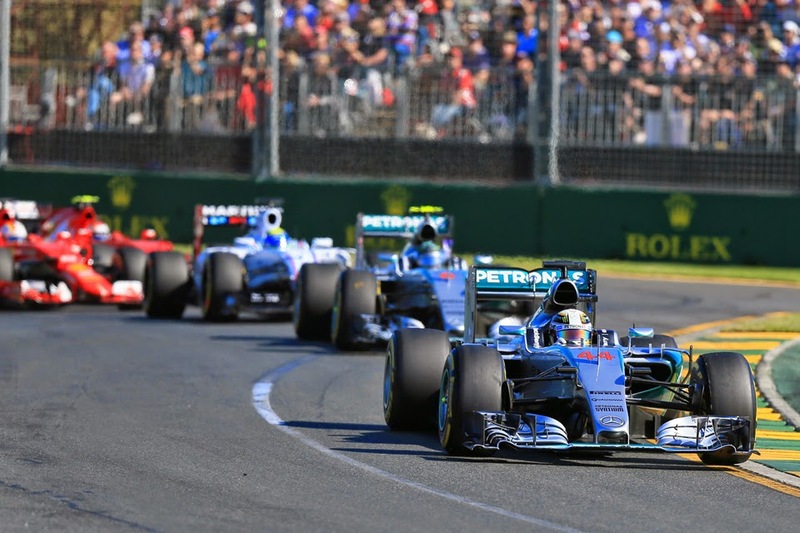 Lewis Hamilton won the Australian Grand Prix, and from the get-go it never looked in doubt. Yes Nico Rosberg as mentioned for the duration was never far from his exhaust scent. But Lewis was toying with his team mate. After the first lap of green flag racing following an early safety car appearance he was 2.3 seconds up the road. As expected too the rest were nowhere - at least as far back as we grew very used to in 2014. Come the end an hour and a half later things hadn't changed a great deal. In between times a pattern developed. Time after time Nico eagerly trimmed the gap ahead, but as soon as it got to around a second and a half Lewis immediately put the hammer down to streak clear again. It was a classic retention of command while taking the least out of your car, your tyres and your fuel - especially important in the current formula. 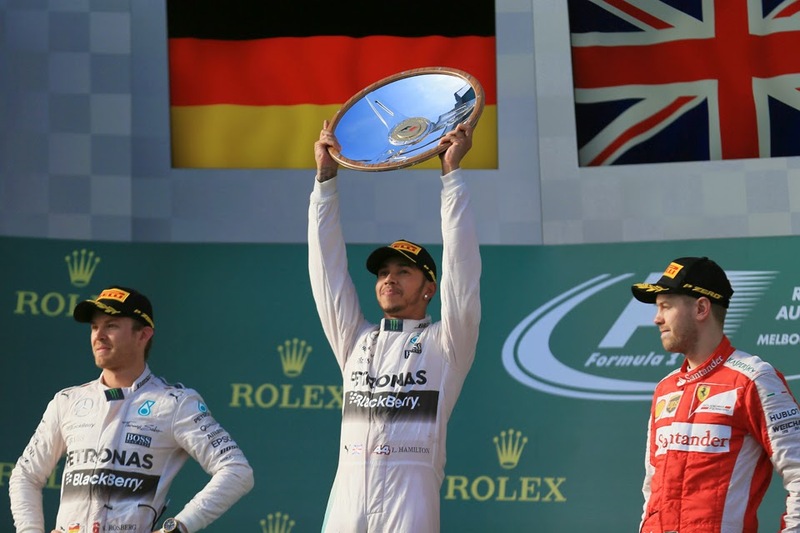 And for Rosberg it was all an exercise in futility. For all that we associate Lewis with his right foot - his instinctive skills and relentless attacking style - as we witnessed increasingly in the course of last season these days he also can control a race like Jackie Stewart. But his glee expressed at the victory was inimitably Lewis. 'Awesome, absolutely awesome. I can't believe it' he beamed. 'It was a hard race still, even though we were that far ahead of everyone it still was a good race between me and Nico'. You suspect though he was being modest. And indeed he not long later hinted as much: 'today I didn't struggle with pace at all. If I needed it I had it'. Interestingly too, just like after qualifying Lewis talked in terms of his greatest battle in order to prevail being that with himself. 'It's reassuring, (about) my method of getting my head in the right space. And I can't tell you how difficult a year it's been to this point. It's not been the easiest of starts of a year, so to come here still with a fresh mindset and to be able to execute it the way I did I'm really happy with that'. But given that when all is well in his world almost no one can stay with him it doesn't seem like the worst approach. 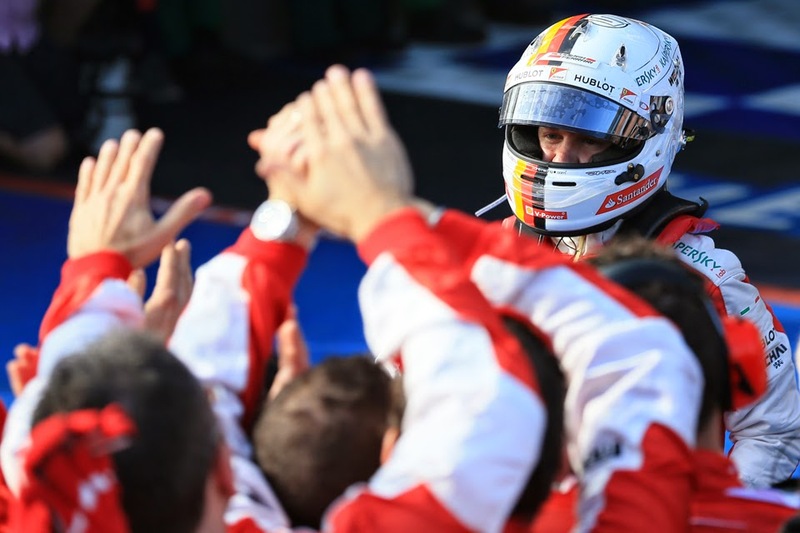 While for Nico, despite his clear cause for disappointment he retained a positive outlook. 'It's a nice feeling to be second today because it's an awesome start to the season for us as a team', he stated. The goings-on of last year reminded us repeatedly that Nico is not one to be written off with confidence. But having apparently spent the off-season apparently working relentlessly on his weaker areas in order to get on terms with Lewis he'd be forgiven right now for thinking something to the effect of 'what have I got to do?'. Fortunately though 11 of them made the flag; astonishingly one of them was a McLaren. Jenson Button more than doubled the MP4-30's record mileage in one go in so doing, though he was lapped twice and was the sole finisher not to score. Furthermore the race was a slightly tepid one. As mentioned there was no doubt over who the winner would be, and furthermore wheel-to-wheel action throughout the field was severely limited, related in part at least to durable Pirellis and conspicuous fuel saving at one of the season's toughest circuits on petrol use. For much of the way about the only diverting battle was that between Button and Sergio Perez over last place. But for all of that there were plenty of worthy efforts on show. Not least Ferrari's which on the basis of Albert Park running looks the best of the rest, a fact as things stand admitted by its direct rivals. Sebastian Vettel completed the podium after keeping Felipe Massa in sight in stint one and then lapping strongly after the Brazilian pitted prior to his own stop, so to emerge in third, where he stayed until the end. Kimi Raikkonen too showed good pace in spells of the race - indeed both Ferraris at times looked to be in the Merc ballpark on lap time - on an attacking two-stopper. But his day was a frustrating one; both of his pit stops were botched, the second of which ended his race as his left rear was loose as he sought to return to the action. More pain for the Finn likely awaits in Malaysia for that, such is F1's odd way of things. But amid all of the excitement and optimism sight should not be lost that the quickest red car finished 35 seconds after the leading Merc, which you suspect had something in hand. Almost identical to what happened 12 months ago, in fact. While our three debutants demonstrated yet again that whatever else is the case F1's future when it comes to driving talent at least is assured. Chief among them was Felipe Nasr, who stormed to a fifth place finish. Even though the Sauber team has endured a difficult week Nasr's run appeared to confirm everything about the car from testing and more. It looks a solid design, and one uplifted by a much improved Ferrari power unit. Best of all it's reliable. But even so, no one expected it to leave a Red Bull behind which is precisely what it did. And Nasr's result combined with Marcus Ericsson's eighth means that Sauber already has 14 points after scoring a big fat zero in all of 2014. While Nasr - just like the other new boys - looked imperturbable. Carlos Sainz scored on his bow too - in his case for ninth and this despite being another to endure terrible pitwork. While his Toro Rosso stable mate Max Verstappen would likely have joined him but for a technical breakdown at mid-distance. But for Red Bull the race was a disappointment. As mentioned only Daniel Ricciardo made the start and while you suspect that he did everything he could he finished a lapped sixth and as also mentioned couldn't stay with Nasr's Sauber. 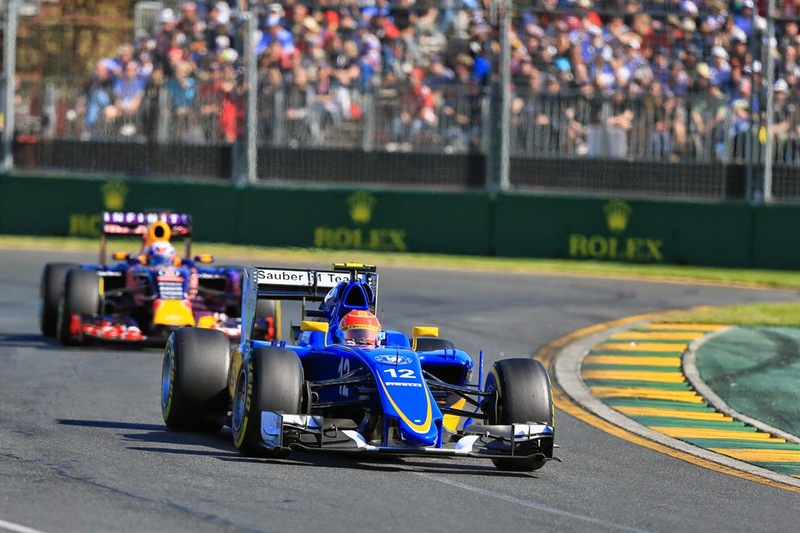 The team is impeded by what again appears a rather gutless Renault engine - and isn't shy to tell everyone as much - but some in the course of the weekend in Albert Park went further and wondered if the once haughty squad had rather lost its sparkle. Perhaps so, but then again the Milton Keynes team is another we've been starkly reminded in the past more than once to be sure of your case when writing it off. It was indeed one of those races that might euphemistically be described as 'not a classic', but it found a worthy winner, in both the victorious driver and team. And afterwards it was pointed out that in the circuit's now 30 year history every squad that had taken a one-two finish at Melbourne has in the end taken both of that season's championships. Not that in this case that offers much of a revelation. And on today's evidence it is tempting to think the drivers' title destination could go a similar way.